When a person is looking to lose weight, there are several diet plans that they can follow. Not all of these diets are healthy. Others take a long time for a person to see results. One of the best diets for weight loss and to improve overall health is the juicing diet. This diet has a person consuming an all liquid diet. For breakfast, lunch, and dinner a person will have a diet that consists of fresh fruit and vegetable juices. No additional sugar or artificial ingredients are added. This diet will allow a person to get all their vitamins and minerals in a balanced drink. When a person is on a juicing diet the types of fruits and vegetables, they choose can play an important role in the success of this diet. A person should include foods that are considered to have a negative calorie count. This means that the body uses more energy to digest and process these foods than the foods have in them. Foods that have negative calories include apples, most green vegetables, lettuce, and carrots. Foods that a high in vitamins should be part of the juicing diet. This includes spinach, oranges, and berries that are rich in antioxidants. To get the most of out the juicing diet there are many different vegetable and fruit combinations that provide nutrients and taste good together. When getting the juice out of the fruits, be sure to keep some pulp. The pulp has natural fibers that are good for the digestive track and will help keep a person regular. Always use fresh fruits and vegetables. Canned and frozen products often have added sugar that will not help a person on a diet. When a person is introducing solid foods back into the diet, it is recommended that they do so slowly. Crackers and other light foods are recommended first as to not upset the digestive track. A person can stay on a juicing diet for several weeks as long as they are getting their daily servings of vitamins and minerals. Fruit juices can make a person feel full and satisfied. The following juicing recipes are a great way to get started on a juicing diet plan. The are simple to make and have a pleasant taste. 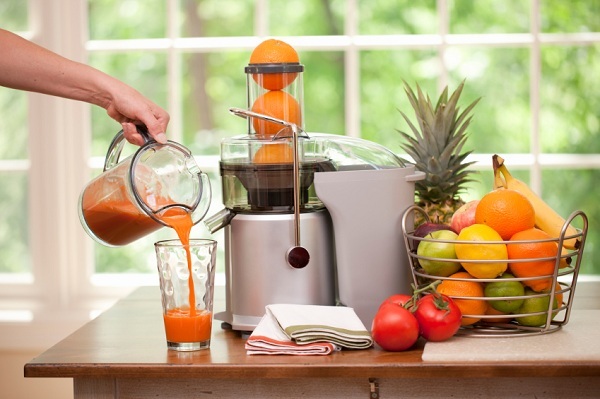 Check out centrifugal juicers as they’re versatile and very easy to use for simple juicing recipes. Clean and peel the fruit. Slice up the apple, peach, and kiwis. Put the fruit in the juicer one at a time. When all the fruits are juiced , stir and enjoy. Wash and peel the vegetables. Slice the carrots, and cucumbers. Put the spinach through the juicer first followed by the carrots and cucumber. This recipe will speed up the weight loss process. When a person is following a juicing diet they can lose a lot of weight while still getting all the vitamins that they need. While this diet does take some discipline to follow the results are worth the hard work.